Spend much time on the Internet? If so, you may notice that the worldwide web is packed with advice, much of it confusing and contradictory. For example, household hint sites love to tell you either, "Oh yeah, you can put anything smaller than a sofa in your washing machine" or "Keep the washer strictly for cleaning clothes." Well, here's the happy medium -- advice on when to machine wash, when to use caution, and when to avoid it altogether. Cushion covers … or the whole cushion. Try to buy (or sew) throw pillows and couch cushions that are envelope style or zippered, as these are super simple to remove for washing. Turn inside out and close zippers for best results. Line dry. If you can't remove their covers, small cushions can be put directly into the washing machine. Curtains. I clean my lightweight living room curtains in the washer once or twice a year, using cold water, the delicate setting, and a minimum of laundry detergent. Afterward, I rehang them on the curtain rods to air dry -- no need to waste energy running them through the dryer. Shower curtains. Launder your shower curtain occasionally to remove soap scum and mild mildew. (Check the care label first.) Add a few towels to the load and use a heavy duty setting. Note: machine washing will probably not remove an advanced case of shower curtain mold. Any clothes saturated with gasoline, lighter fluid, or oil-based paint. Besides leaving an oily residue and unpleasant smell inside your washing machine, these liquids are flammable. Do not machine wash immediately after use. Instead, leave them to air dry for several days first and never put them in the dryer. Underwire bras. As your washing machine agitates, that eponymous bit of wire can easily work its way out, then get stuck in the washer's innards. That means you'll have to pay for an expensive handyman service call to get it unstuck. Easier simply to wash dainty underthings by hand in lukewarm water. Pillows. My results from cleaning pillows in the washer have been meh. 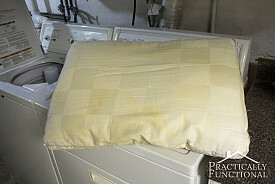 Foam pillows cannot be machine laundered, and as for other types, I've found machine washing tends to have a flattening effect or cause odd folds in the stuffing. True, the pillows smell fantastic, but they're never quite as comfortable as they used to be. Since most of the pillows in my home really only need freshening, I prefer to set them out in the sunshine for a few hours. One exception: When my Jack Russell rescue's sleep pillow develops a distinct doggy aroma, into the washer it goes. Bath mat. It may seem like an amazingly easy idea to just toss your bath mat into the wash but wait a minute. Once its backing has begun to crumble, it is capable of making an enormous mess of all your laundry. Not great for the machine itself, either. Lego. Laundering those teeny tiny bits of Lego pieces is a wonderful way to remove goo and grimy from little hands (and mouths). However, closing them up in a special zippered laundry bag is a must. This keeps the miniature Lego bricks from getting lost and potentially damaging your washing machine. Suede. Reports from folks who've tried machine cleaning Uggs boots or other suede items are, to say the least, mixed. Some claim fabulous results, while others state that the fleece lining was nice and fluffy again after washing, but the exterior became dry and wrinkled. I have personal experience with machine washing suede bedroom slippers (which I'd worn when cleaning the oven -- not a good idea!). They bled a LOT of dye and dried stiff and uncomfortable. Your mileage may vary.